As a company, our primary mission is to liberate women from their baggage. However, the way we seek to achieve this mission is just as important as the mission itself. As independent entrepreneurs, our company is the truest reflection of our values, our dreams, and our raison d'être. Sustainability, based on our love for the earth and all of its animals, has always been a major part of our company DNA. This is why we choose to only use materials that are people, animal and planet friendly in our designs, and choose to produce them locally, only a few miles from our office in Los Angeles. However, after watching the documentary Racing Extinction (if you haven't seen it yet, go! now! ), we realized just how truly in peril the health of our planet (and all of its inhabitants) really is. The scariest part? We humans are to blame. Rainforests are perhaps the most important natural resource on Earth, yet they are also the most in danger of being completely destroyed. Rainforest destruction has been swift, as palm oil plantations, large-scale farming, logging, cattle pastures, mining and oil drilling rapidly expand. This is a major problem for the planet for several reasons. First, rainforests safely store billions of tons of carbon annually, helping to keep the earth’s atmosphere in balance and warding off climate change. How do they do this? 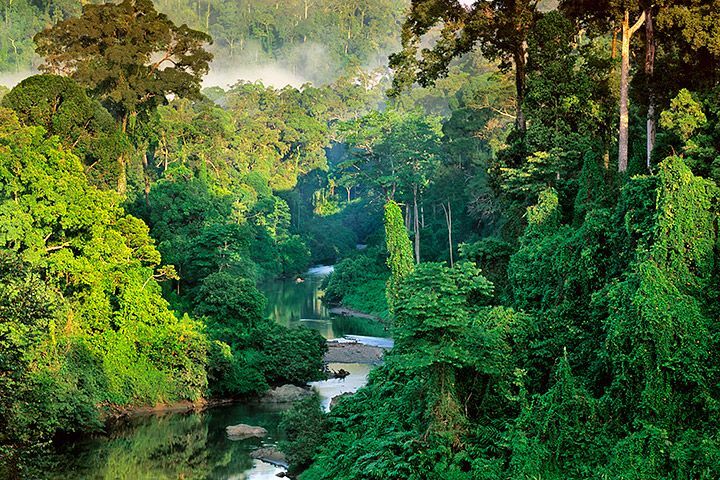 Like all green plants, tropical forest trees take in carbon dioxide and release oxygen during photosynthesis. During respiration they emit carbon dioxide, but in generally smaller amounts than what they take in during photosynthesis. The remaining carbon is stored in the tree, allowing it to grow bigger. If the tree is burned or cut down and allowed to rot, the stored carbon is released into the air as carbon dioxide. It is estimated that almost 30% of our carbon emissions currently come from burning our earth's rainforests! Rainforests also are the single most important, untapped resource for scientific and medical discoveries -- currently, a quarter of all medicines are sourced from plants found deep in these tropical forests. Who knows what potential medical breakthroughs will never be discovered because they have been burned to make way for oil drills, paper cups or cattle pastures. Finally, rainforests are home to thousands of unique animals that depend on them for survival. It’s estimated that 137 plant and animal species go extinct as a result of rainforest loss every day. How can we possibly believe that any of this represents good stewardship of the earth? What can we do? From now until Earth Day (April 22) we are donating 5% of every bag sold online to an amazing organization called Rainforest Trust (www.rainforesttrust.org) -- a world leader in the protection of tropical ecosystems and wildlife. We're so happy to have discovered this wonderful organization that matches our passions for protecting our planet's resources and the conservation of wildlife. They've protected millions of acres of rainforest from destruction while helping the world’s most endangered species rebound and thrive. Rainforest Trust protects threatened tropical forests and endangered wildlife by partnering with local and community organizations in and around the areas that are being threatened. After they purchase acres of endangered land, they empower local people to help protect it by offering them education, training and employment. Current projects include "Saving Sumatra's Rarest Wildlife" by creating protected areas in the Bukit Tigapuluh ecosystem of Sumatra to protect critically endangered Orangutans, Elephants and Tigers, and "Refuge for the Red Panda in the Himalayas," a completed project which sought the creation of a Imawbum National Park for the Myanmar Snub-nosed Monkey, Chinese Pangolin, and Red Panda, among other species. Please visit www.rainforesttrust.org for more information rainforests, their important impact on the planet and additional ways you can help.